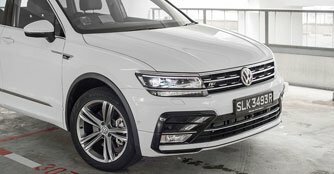 If there's anything more competitive than the Singapore education system, it's probably the sport utility vehicle segment, where manufacturers are pumping out models to fill every nook and cranny in sight. 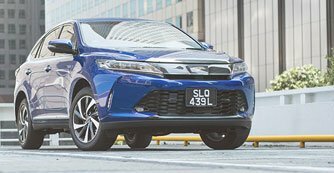 As far as mid-sized ones go, the latest to join the already expansive list of choices here is the new made-for-Singapore turbocharged Toyota Harrier. The Harrier, which is perceived by many as a more atas Toyota, is an already established namesake here and this new turbocharged variant promises to offer more performance and higher levels of desirability. To find out just how well it ranks amongst its peers, we pit a 2.0 Premium-trimmed Harrier against the equally new Mazda CX-5 2.5 Super Luxury and the more expensive, second generation Volkswagen Tiguan 2.0 TSI DSG R-line. While all three are good-looking cars in our eyes, the Harrier - as the most affordable car here at $155,988 (as of 15th August) - does look the least impressive. That could be attributed to two things in our opinion; its odd plasticky front grille and the fact that the car is commonplace on our roads. However, it's a safe design that's slightly more upmarket for the brand, which many Toyota loyalists will appreciate. The CX-5 on the other hand has a cleaner, but sportier design that oozes seduction, aggression and elegance. In the Japanese market today, Mazda is killing the game with its fantastic 'KODO: Soul of Motion' design language and the CX-5 is the latest example of that. The Tiguan, in R-line trim, is distinctive and masculine thanks to its well-defined shoulder lines. The best way to describe its sheet metal is as if a BMW X5 had an unholy mating with the Volkswagen Golf R, resulting in a car that looks expensive and has tons of road presence. But to be fair, it is also the priciest car in this comparison with an asking price of $195,400 (as of 11th August). 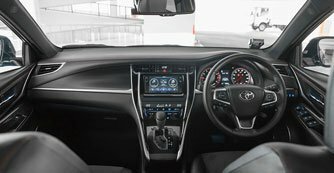 The Harrier's cabin, when compared to Toyota models before, has a plusher and more comfortable vibe thanks to its all-black, soft-touch interior panels and button-less centre console. However, jumping over from the CX-5 and Tiguan cabins, you immediately begin to feel a noticeable difference, in the sense that the faux leather, which clads the Harrier's cabin, is tacky and has an unattractive shine to it. The poorer quality of the Harrier's switchgear is apparent, too. That said, credit has to be given for how comfortable and quiet the Harrier is to ride in, with very little road and wind noise trespassing. Despite costing just $2,812 more than the Harrier, the CX-5's cabin quality is a few notches higher in terms of materials used and overall build. In fact, take away the Mazda badging on the steering wheel and you might be misled to believe you're in a European-made car. 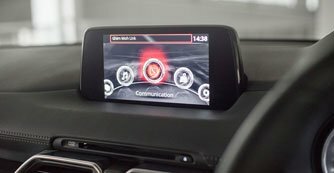 Design is modern and minimalistic, too, with a touchscreen infotainment system that's as highly intuitive as the Tiguan's. In comparison, the Harrier's less user-friendly unit will take some getting used to.